Sacramento County Sheriff Scott Jones and Immigration and Customs Enforcement Acting Director Thomas Homan held a public forum to discuss immigration in Sacramento on Tuesday. They were not ready for Bernard Marks. 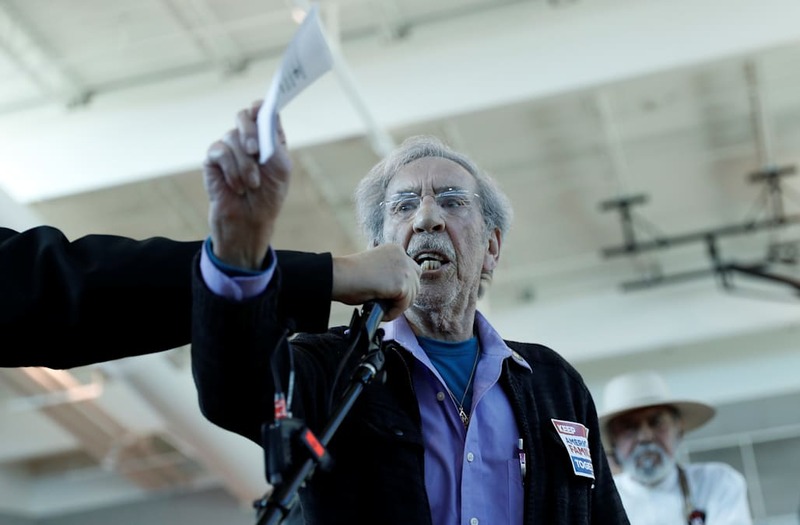 Before a rapt audience, the local educator and Holocaust survivor shamed the two law enforcement officials for rupturing immigrant families and prioritizing the interests of the Trump administration over those of local residents. "When I was a little boy in Poland, for no other reason but for being Jewish, I was hauled off by the Nazis," Marks began his statement. "And for no other reason I was picked up and separated from my family, who was exterminated in Auschwitz. And I am a survivor of Auschwitz and Dachau. "I spent five and a half years in concentration camps, for one reason and one reason only: because we picked on people, and you as the sheriff, who we elected as sheriff of this county — we did not elect you for sheriff of Washington, D.C.," Marks said. "It's about time you side with the people here." Marks then made reference to recent news reports that ICE agents were entering courthouses in California to arrest undocumented people — a practice that Chief Justice Tani Cantil-Sakauye of the Supreme Court of California condemned in her state of the judiciary address on Monday. ICE spokesperson Virginia Kice confirmed earlier in March that her agency does indeed use this tactic, but only when investigators have "exhausted other options," according to the Associated Press. "[When] this gentleman [acting ICE Director Thomas Homan] stands up there and says he doesn't go after people, he should read today's [Sacramento] Bee," Bernard Marks added. "Because in today's Bee, the Supreme Court Justice of California objected to ICE coming in and taking people away from the courts. Don't tell me this is a lie. "You stand up here Mr. Jones. Don't forget — history is not on your side," Marks concluded. Marks has spent decades educating people about the horrors the Jewish people faced under the Nazis in Europe, using his personal experiences as a point of reference. He has written opinion pieces for the Sacramento Bee about immigration in the past, and as demonstrated in Tuesday's speech, remains a staunch opponent of current ICE practices. President Donald Trump, for his part, has overseen an aggressive crackdown on undocumented immigration since he took office on Jan. 20. On Jan. 25, the president signed an executive order affirming his administration's commitment to enforcing immigration law, calling for expedited processing of people suspected of being undocumented and more rapid deportations once that determination is made. He also continues to press for a massive wall to be built along the United States' southern border with Mexico.